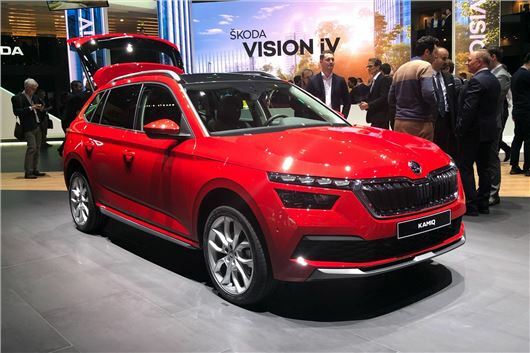 Skoda has revealed its new Kamiq small crossover ahead of it going on sale in autumn with prices expected to start at around £17,000. The Kamiq is closely related to the SEAT Arona and upcoming Volkswagen T-Cross, and will rival the likes of the Nissan Juke and Citroen C3 Aircross. It sits below the Karoq and Kodiaq in the Skoda's range. The interior features a large and high set multimedia display on the dashboard. This is expected to be standard on high-spec models, while smaller alternatives will be offered further down the range. There's also an optional 10.25-inch Virtual Cockpit in place of conventional dials behind the steering wheel, while ambient lighting in copper, red or white will (Skoda says) give the Kamiq an upmarket cabin feel. It's marginally longer than the SEAT Arona, giving rear passengers 73mm of knee room, while 400-litre of boost space is identical to its Spanish rival. Naturally, there's a choice of the usual Volkswagen Group engines, including 1.0- and 1.5-litre TSI petrols, and a 1.6-litre turbodiesel. Buyers also get a choice of six-speed manual and seven-speed DSG automatic gearboxes. Optional Sport Chassis Control sits 10mm lower than the standard suspension, while an extra Sport mode stiffens up the dampers for a sportier drive. Underbody protection can also be specced for a fee for those planning to venture off road. Prices are yet to be announced but it's likely to be priced closely to the SEAT Arona, which currently starts at £17,145.